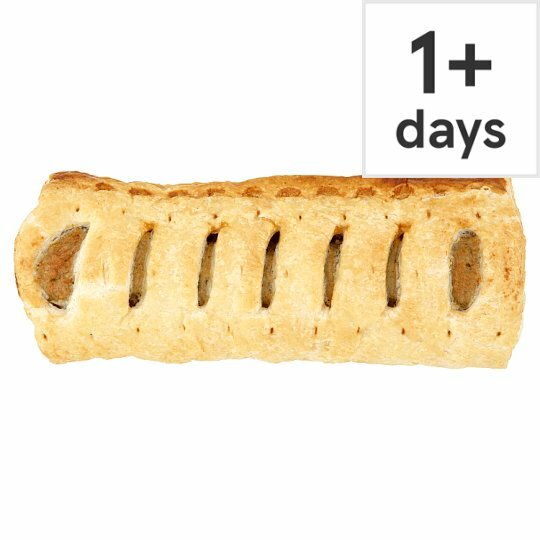 Tesco Jumbo Sausage Roll. Seasoned pork sausage meat wrapped in a golden puff pastry. Our experts carefully select ingredients to create perfect combinations of flavour and texture. Wheat Flour (Wheat Flour, Calcium Carbonate, Iron, Niacin, Thiamin), Pork (25%), Water, Palm Oil, Onion, Rapeseed Oil, Salt, Pork Stock, Dried Skimmed Milk, Parsley, Sugar, Nutmeg, Black Pepper, Brown Sugar, Mace, Thyme, White Pepper, Sage, Cornflour, Onion Concentrate, Emulsifier (Mono- and Di-Glycerides of Fatty Acids), Tomato Paste, Garlic Concentrate, Antioxidant (Citric Acid). Contains milk, gluten and wheat.For allergens, including cereals containing gluten, see ingredients in bold.